← Brad and Angelina enjoyed Egypt – but why just look at their holiday photos when you can also visit us? From late April through May, and again in September and October, Taba Heights is sometimes home to Rhincodon typus, the whaleshark. Sightings in 2012 started in the beginning of May, when whale sharks were spotted just off the beach of the InterContinental, at the diving and snorkelling site “Fjord”, near Farun Island, and even in Waterworld’s confined diving area just 10 meters off the beach. Waterworld observes a strict policy regarding interaction with the animals: swimmers are not allowed to touch or swim in front of the animals, and boat engines are cut to allow whalesharks to safely pass close by if they wish to do so. Those who were fortunate enough to swim and snorkel with whalesharks measuring between 5 and 7 meters in length reported that it was a spiritual, soul-stirring experience. 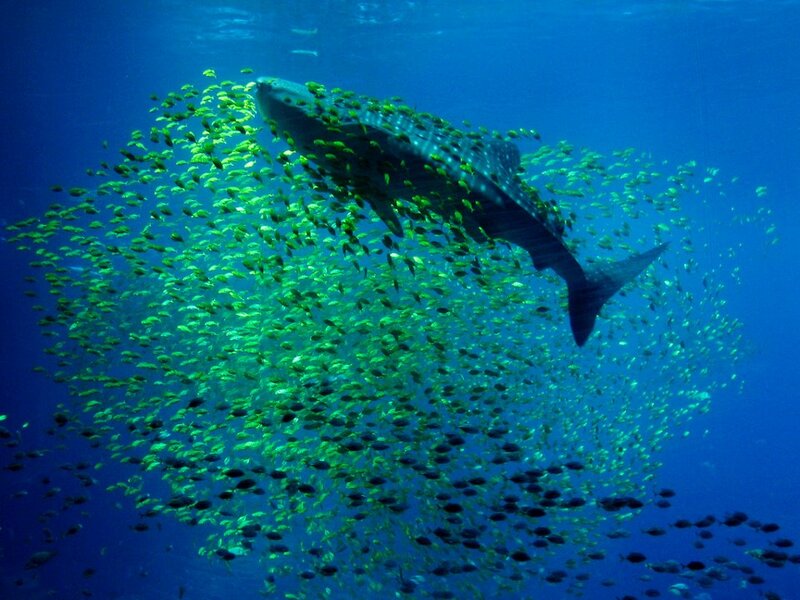 The biggest whaleshark ever recorded was over 12 meters long. Despite their name, they are passive, docile fish that sometimes allow humans to swim with them for long distances. Once they tire of the attention, they either rapidly accelerate away, or simply descend into the depths, making any time spent with them feel precious and a real privilege. Their diet consists mainly of tiny plankton scooped up in their wide mouths while swimming. Other wildlife spotted near Taba Heights includes turtles, as well as occasional encounters with dolphins swimming along the coast alone, in pairs, or in whole pods. Most sightings take place during snorkelling or diving trips on board vessels, but guests should also watch for these animals while enjoying the hotels’ beaches. Thanks to Taba Heights News for this information.